City tours in Freiburg - Welcome! Small groups, young dedicated guides, and lots of fun await you on our guided tours. You'll experience Freiburg in a special way with us: We'll tell you some fascinating stories, explore the charming "olde worlde" streets and lanes with you and introduce you to some of the local wines. Our motto says it all: Discover Freiburg! . Culture and cuisine - a perfect combination that will surely create lasting memories. Whatever your plans are for the rest of your stay in Freiburg, a guided tour is an excellent way to start. Our culinary tasting tours to Freiburg's daily farmers' market are proving to be a real winner amongst tourists and locals alike. Your eyes and ears are in for a real treat and you'll also get to taste some of the culinary delights this region is so famous for! We are very flexible and can offer you a wide range of guided city and culinarey tours as well as trips to Freiburg’s surrounding areas. Are you looking for something different or out of the ordinary to do in Freiburg? We are a group of qualified local Guides and our speciality is the lively city of Freiburg. Our style? We like to take a friendly, enthusiastic approach to tours, sharing plenty of anecdotes (and the odd glass of wine) along the way! From May onwards we offer weekly bilingual Tours of Freiburg for singles, pairs and small groups. Book your tickets online! Highlights of the old City Come and delight in the city of Freiburg - there is so much to see! 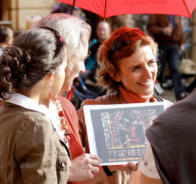 Singles, pairs or groups are invitied to take part in our weekly bilingual tour (English/French) of Freiburg. Discover the main historic sites of Freiburg while strolling through charming cobble-stoned alleyways. Learn more about the city´s famous Bächle (streams) and mosaics. Get a taste of medieval life by visiting our gothic cathedral and its colourful market. Our friendly bilingual tourist guide will welcome you at the Rathausplatz (Town Hall square). * Students, Pensioners above 67 years of age, people with disabilites (with a disability ID card). Children under 15 years free. Tickets available online or in person at the Tourist Information Centre (Rathausplatz).